Which Used Electric Golf Cart Is The Best Bet? So you have been thinking about buying a used electric golf cart but you just don't know where to start. Here we will discuss so of the do's and don'ts before you make your final decision. Not only are there tons of different manufacturers of carts but there are a small mountain of models, cart body styles and options available. It is also important to decide what the application of your cart will be. Why is that important you ask? Firstly, are you planning to use your cart only on the golf course or will it be used on city streets as well? If you want to use it for multi-purposes it is best to check with your city or municipality to see whether golf carts are legal on the local streets. Do you have your heart set on an electric cart?.... or is gas or solar a possibility? Most private and resort clubs trade in their fleet of carts for new ones every few years.....This is to your advantage! There are thousands of "as is" or "refurbished" carts in the marketplace at any given time. This gives you...the bargain hunter.....loads of great choices. 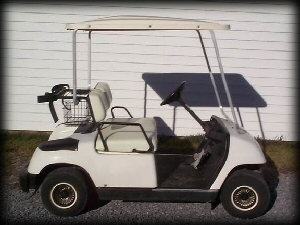 The cheapest golf carts are always the ones that are sold "as is". These are generally carts that are older, have more miles, and don't come with any kind of dealer warranty. Unless you are either very familiar with the mechanical side of things or really trying to save every last buck this can be a more risky proposition. If you go to a dealer you more often than not will get a used electric cart that has gone through a very thorough inspection and comes with a warranty. The refurbished cart his will give you the assurance that it is in good working condition, reliable and most of all safe. The three biggest names in electric carts by a mile are E-Z-Go, Club Car, and Yamaha. By choosing a model from one of these families you can rest assured that if you ever need repairs, maintenance or parts it can be completed to your liking by a local dealer. So How Much Do You Need To Shell Out? Well that depends on a few things. Do you want a stripped, basic cart?... or would you like a few options? Would you like a like new used cart or an older model? These are questions that you will want to have answered in your own mind before you go out to a dealer unless you like being "upsold".....personally I like to know what I want before going into a showroom. So as a general rule what is on the market below $1,500 won't give you much. Whereas if you loosen your purse strings a little more and get into the $3,000 to $4,000 range you will not only find a very solid machine but you will likely get a few nice options.....things like a stereo, headlights, fancy rims, custom paint just to name a few. So do yourself a favor and do a little homework before buying any used electric golf cart. You will make a better decision and get more enjoyment out of your purchase in the long run.